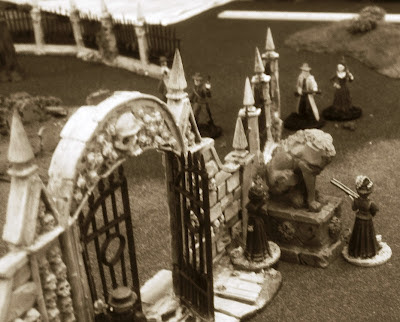 Empire of the Dead, a new Victorian Steampunk Horror game, was released recently, & tonight was our 1st night of "league" games. 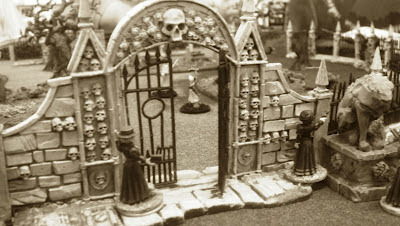 It's similar in concept to Mordheim, or any other gang skirmish game. You create a gang, fight other gangs, & your gang gains skills & money to advance itself. The difference with this game is that it's set in 1880 England where both Werewolves & Vampires have come out of the shadows & are now part of society. 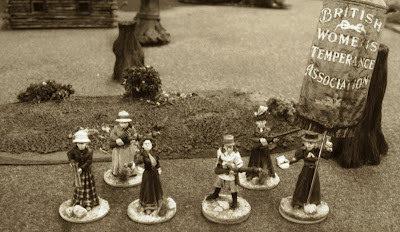 Based on figures I already had painted, I decided to run a British Women's Temperance Association gang. (An actual late 19th century English organization.) Here are the ladies preparing to do battle. Of course they were expecting to fight a different kind of evil spirits. The 1st game was against a gang of hard drinking & hard swearing Americans. The ladies obviously needed to purge them of their evil spirits. Here are a few shots of the women exchanging gunfire with the Yanks. Unfortunately, being from the Wild West, the Americans were able to gun down the Temperance Association with ease. One of the good things about the rules is the after-game campaign system. Even if you lose a game, you still get a small amount of money to help maintain your gang. & if your opponent is significantly more powerful than you, you also get more money based on the points differential. This hopefully will help reduce the chance of 1 gang continually winning & getting too powerful for everyone else. 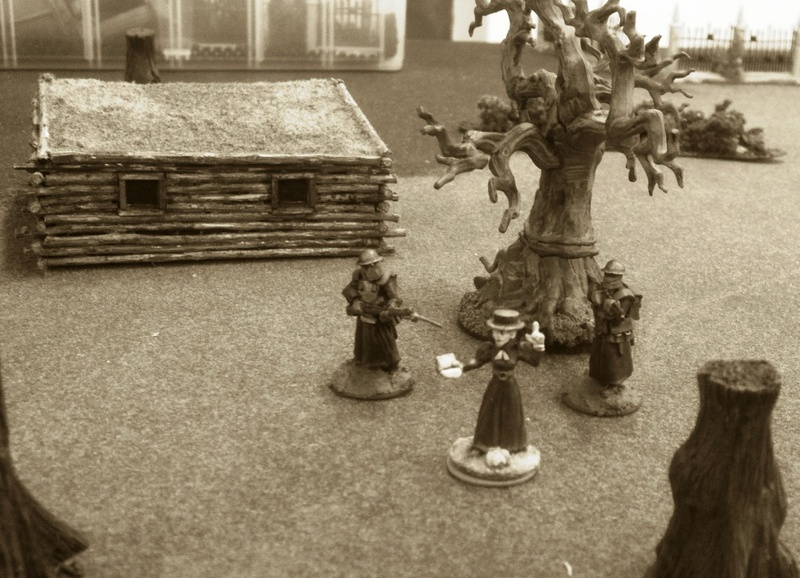 In addition to earning money, getting more skills for your figures, and buying more equipment, after a game each wounded figure is also rolled for on an injury chart to see the severity of the wound. There's a 30% chance it was just a flesh wound & the figure will be fine. But a figure could lose an eye, get a leg wound (reduced movement), an arm would (reduced strength), or die. 2 of my wounded ladies got some of the more interesting results after the battle with the Americans. One was captured by the American gang. The opposing player was nice enough to ransom her back to me if I allowed him to keep her equipment. The other lady was captured by the "Peelers" (police). The figure arrested by the police was the one with the book & giant banner, so the visual of her being hauled off to jail, fighting all the way, seemed to fit very well. Since she was captured by the police, I had the option play a special scenario against a police gang where I tried to rescue her, which I of course attempted. Here is a picture of her with her jailors in front of the hanging tree. Unfortunately, since the British Women's Temperance Association is made up of women, they had no military experience, so their rescue plan failed spectacularly. The women attempting the rescue got away, but sustained further permanent injuries. Their incarcerated sister stood trial, was convicted, & sentenced to miss 2 games (based on die roll against a table in the book). We're still learning the game mechanics, but the rules themselve seem reasonable. There was nothing that jumped out at me as glaringly wrong. & with only needing 5-7 figures to start with, it's a great game to get into. 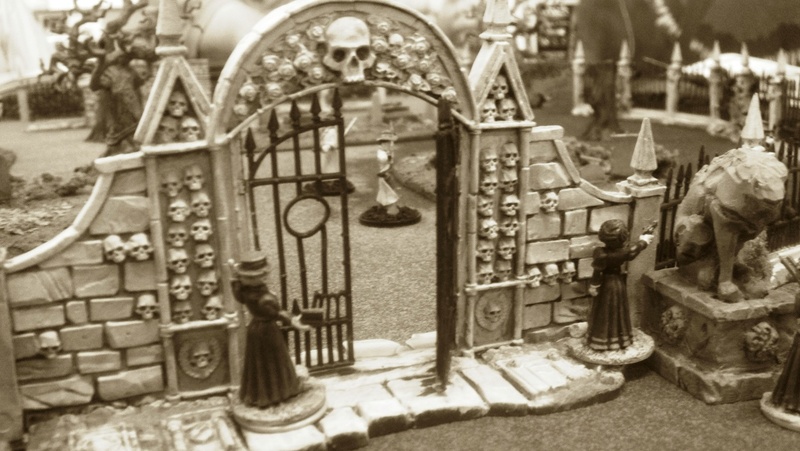 If you want to read more about Empire of the Dead & see some beautiful terrain, here are some other game reports from one of the other players who ran a massive Empire of the Dead game at a recent convention.